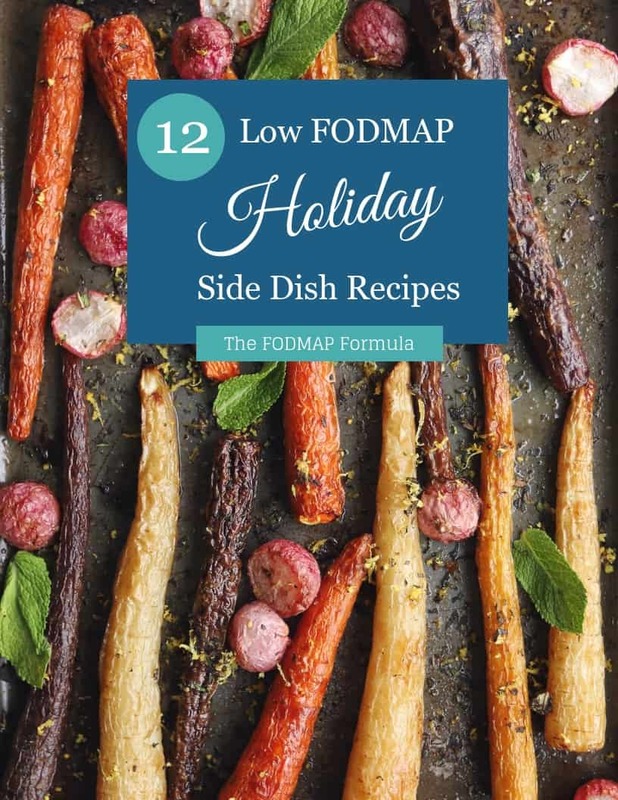 Worried following the Low FODMAP Diet means you’ll miss out on stuffing this holiday? Don’t panic, friend! I have you covered. While it isn’t exactly the same as a traditional bread-based stuffing, this quinoa stuffing has a hearty flavour you’ll crave all year long. The first thing you should know is that I’m obsessed with stuffing. So, when I say this low FODMAP quinoa stuffing amazing, I’m not kidding. Made with low FODMAP chicken broth and classic ingredients like carrot and celery, this quinoa stuffing has the rich, savoury flavour you crave. Quick and easy to make it can also be scaled up or down, depending on how many guests you’re expecting, making it a perfect holiday side dish. Think this low FODAMP Quinoa Stuffing sounds great, but you don’t have time to try it now? Don’t worry, you can PIN THIS POST for later! Trust me! 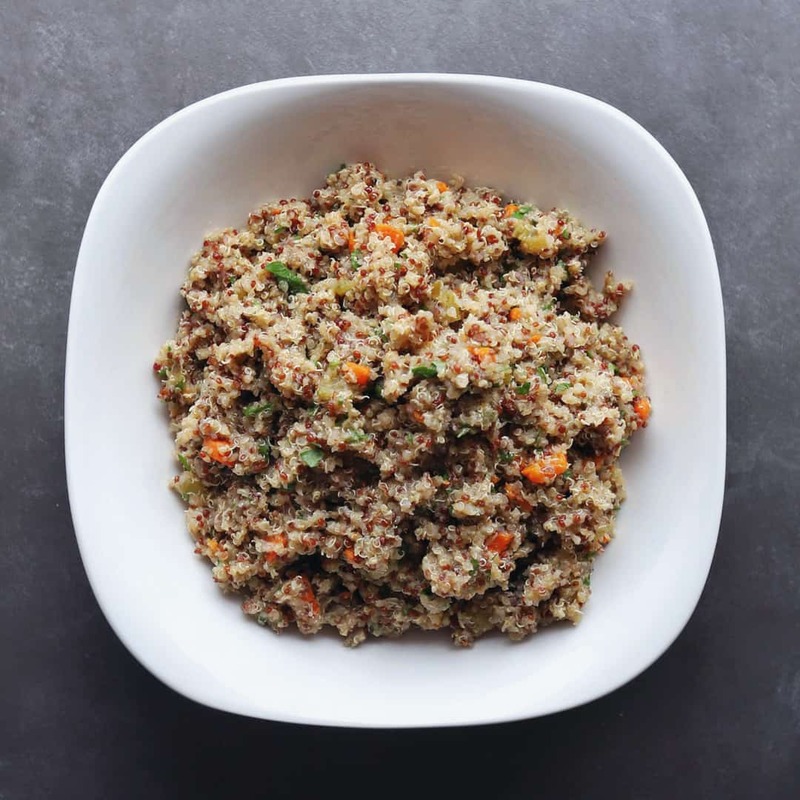 You’ll want to make this mouthwatering low FODMAP quinoa stuffing all year long. Check out the notes below for tips on keeping this recipe FODMAP friendly. One of our first ingredients is red onion. Don’t panic! 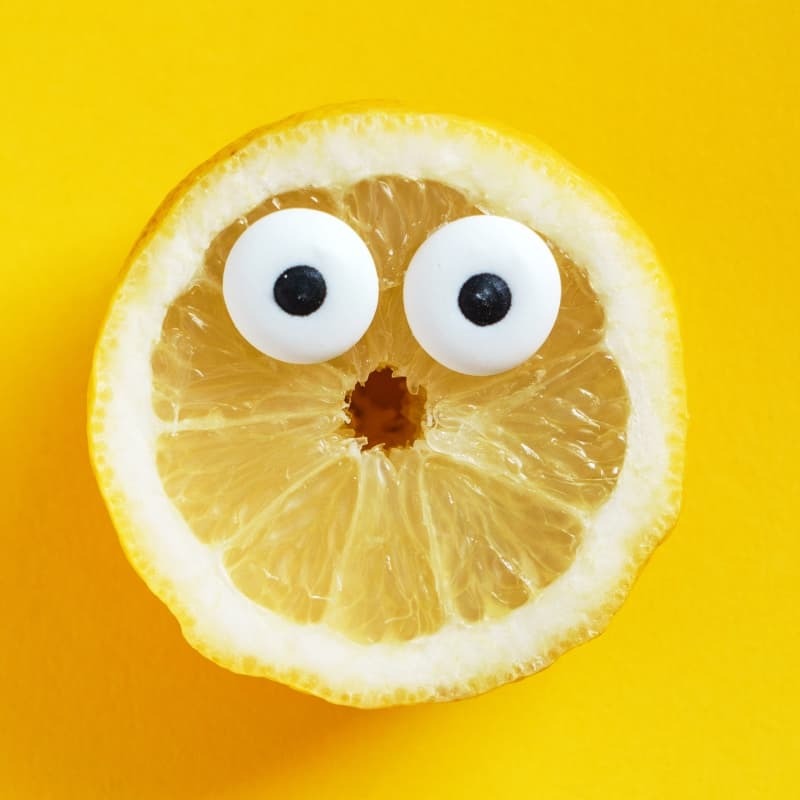 FODMAPs are water-soluble, which means the flavour of high FODMAP foods like onion and garlic can be infused into fats like oil or butter without any FODMAPs leaching out. You can check out more information on the chemistry of FODMAPs here and you can find the official sign off on this process from Monash University here. We’ll be pulling the onion pieces out before adding any other ingredients, so you’ll get all the flavour without any icky FODMAPs. Now that you’ve had a second to recover, let’s talk about carrots and celery. According to Monash University, carrots don’t’ have any detectable FODMAPs, so they won’t add to your FODMAP load. Celery, on the other hand, is only safe in servings of 1/4 stalk (5 cm). Servings of 1/3 (7 cm) or more are high in the polyol mannitol and should be avoided during elimination. That’s not a ton of celery per serving, but don’t worry. This recipe only uses one stalk total which works out to 1/2 a serving per person. We’ll also be using quinoa. According to Monash University, quinoa is safe in servings of 1 cup (cooked). Monash doesn’t recommend a maximum serving size, but I try to stick to 1 cup or less per sitting, just to be safe. Our final ingredient is chicken broth. Finding a low FODMAP chicken broth can sometimes feel like finding the holy grail. So, I always recommend checking your local store’s website to scope out your options at home before you head to the store. For my Canadian peeps, Campbell’s full salt and low salt chicken broth are both low FODMAP. If you can’t find anything at your local store, you can grab this low FODMAP chicken soup base from Fody Food Co.
Because this low FODMAP stuffing is made with chicken broth, I recommend pairing it with poultry dishes. It’s fantastic with my low FODMAP roasted chicken. This recipe is particularly great for the holidays because it can easily be scaled up if your family is turkey-sized. If you want to add something special to your everyday chicken, this recipe is also delicious with my seasoned chicken breasts or these awesome lemon and rosemary chicken breasts. Want to try this low FODMAP quinoa stuffing? Don’t forget to PIN THIS RECIPE for later! Worried you'll have to skip the stuffing this holiday? Don't panic! This savoury low FODMAP quinoa stuffing is a fresh FODMAP-friendly twist on this holiday classic. Heat oil in a medium saucepan over medium-high heat and saute onions until they're soft (2 minutes). Remove the onion pieces from the pan and discard. Add the carrots and celery and saute until they're tender (6 - 8 minutes). Add the thyme and stir for 30 more seconds. Add the quinoa and the chicken broth and bring to a boil. Then, reduce the heat to medium-low and simmer uncovered until all the liquid has been absorbed (about 20 minutes). Remove the pan from the burner and let the quinoa stand for 5 minutes. Then, fluff the quinoa with a fork and stir in the lemon juice and the salt. Transfer to serving dish and sprinkle with fresh parsley. Serve warm. 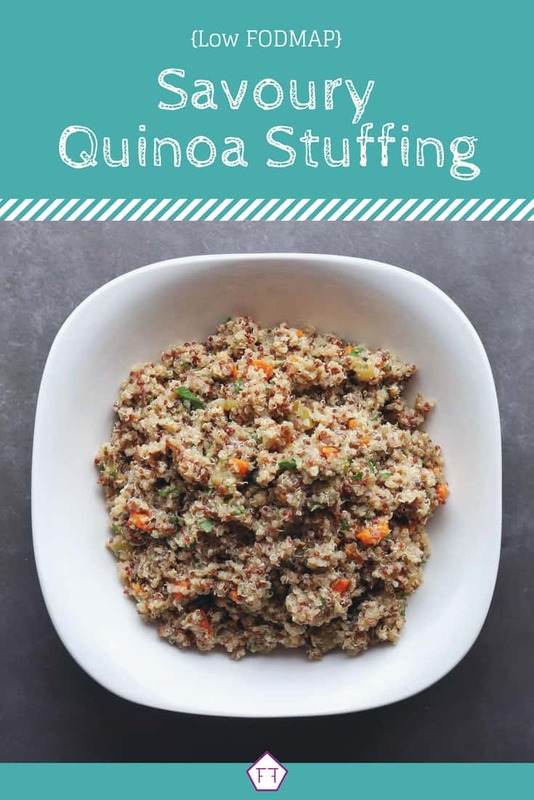 Curb your stuffing cravings this holiday with this quick and easy low FODMAP quinoa stuffing. Did you like this recipe? Don’t forget to share it! Together we’ll get the Low FODMAP Diet down to a science! P.S. Want access to more recipes, articles, and some fabulous freebies? Make sure to sign up for my mailing list below. As part of The FODMAP Formula community, you’ll get additional resources and VIP gifts delivered right to your inbox. Low FODMAP Roasted Garlic Mashed Potatoes: Made with low FODMAP garlic-infused butter, this classic holiday side dish is back on the menu and better than ever. Low FODMAP Gravy: Think following a Low FODMAP Diet means you need to skip the gravy? Think again, friend! This low FODMAP gravy will have your dinner dressed to the nines. Low FODMAP Seasoned Carrots: Lightly seasoned, these roasted carrots will add a ton of flavour to your meal without adding any FODMAPs. Previous post: What is FODMAP Stacking?